Some of the people who took part in the burpee challenge held recently at Fit Kicks, Mohilll. Anyone who has ever started an exercise regime is probably familiar with the particular hell that is a burpee. A diabolical combination of a jump and a pushup they are generally the bane of any gym visit. 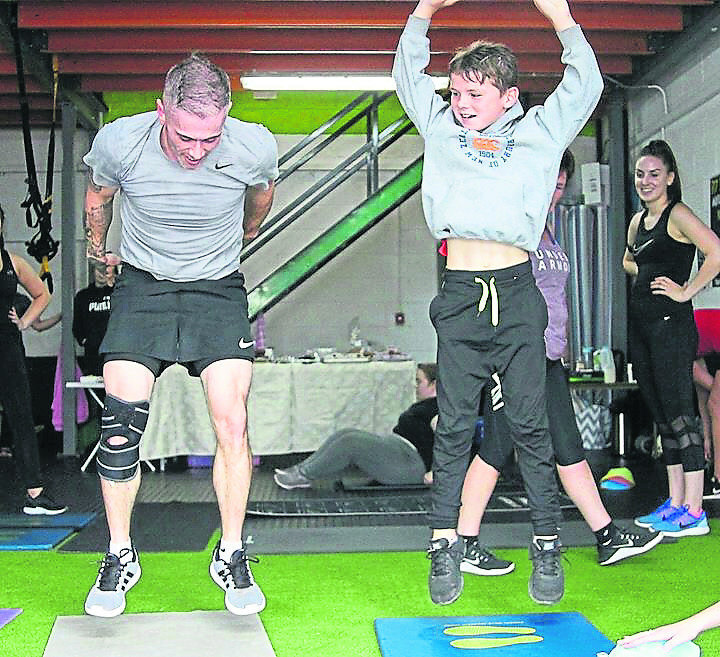 But one gym owner in Mohill has used the dreaded burpee as a way to generate funds to purchase life saving equipment for his local community. Paul Gilgannon, Fit Kicks, Mohill organised the Burpee Challenge fundraiser to raise the money neeeded to purchase a defibrillator for the community. Gym members jointed Paul to complete a gruelling number of burpees. Paul Kilgannon gets some encouragement from a young participant during his 1,000 burpee challenge. Anyone who knows Paul knows he never sets a goal for his clients that he doesn't undertake himself and for the burpee fundraiser, his personal challenge was to do 1,000 burpees - and he succeeded! “This challenge and fundraising effort was also close to my heart as I feel that defibrillators in rural Ireland should be more readily available in all areas,” admitted Paul. “Within three minutes of an incident the chances of survival drastically reduces and does so every minute thereafter. My sister died suddenly a year and a half ago and the response time for ambulances to make it to rural Leitrim are far too inadequate. The new defibrillator will be placed along the roadside near the Mohill Enterprise Centre gates and will be available for the Mohill community if ever needed. “This fundraiser was a fantastic success with Fit Kicks, its members, local businesses and local people getting involved by either helping out, taking part, donating spot prizes and monetary donations which added up to €2700 in total,” Paul said, thanking all involved. Some of the funds raised have also been donated to the Andrew O'Malley Fund - in aid of a young man who was raised in the Mohill area.